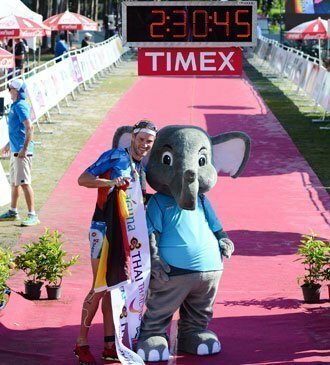 Raelert with “Laguna” official LPT mascot at the finish line. 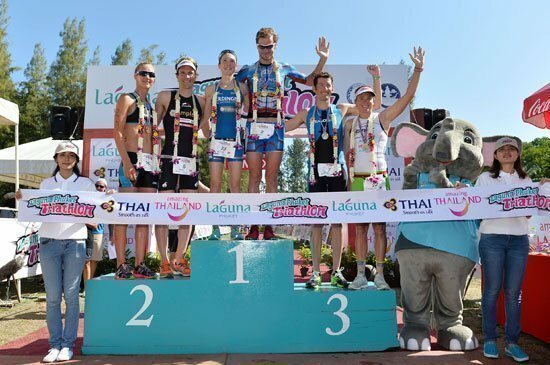 Laguna Phuket’s title holder of the 70.3 race in 2011, Raelert came back today and finished in 2:30:14 (swim 23:55, bike 1:20:06, run 43:44). Followed home in second and third places were Switzerland’s Ruedi Wild (2:32:57) and Stuart Hayes of Great Britain (2:36:17). In the women’s field it was Swiss pro Simone Braendli who took home the win. Recently took victory at the Challenge Triathlon Walchsee-Kaiserwinkl Walchsee, Austria, Braendli finished in 2:48:04 at Laguna Phuket Triathlon today. 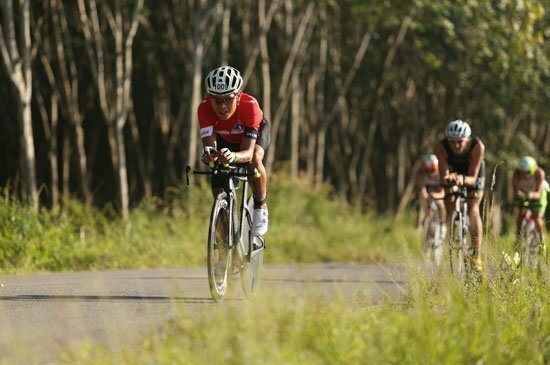 Followed Braendli in second was World Duathlon Champion Emma Pallant of Great Britain (2:52:43) who then saw Phuket-based Australian pro Dimity-Lee Duke finished in third in women’s field (2:56:08). The courses were particularly hot under the Phuket sun today. From left: Emma Pallant, Ruedi Wild, Simone Braendli, Michael Raelert, Stuart Hayes and Dimity-Lee Duke in the shot with “Laguna” the mascot. 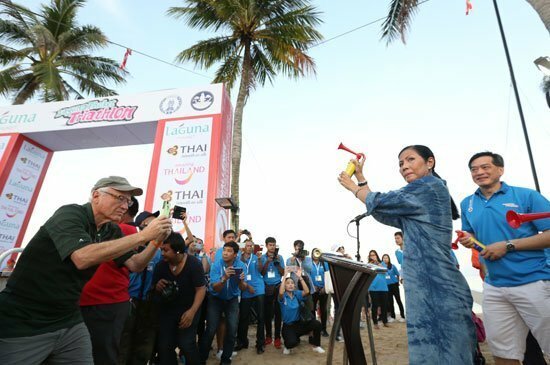 A field of over 1,300 individual pro and age group athletes representing 44 nationalities, 66 relay teams and 6K Fun Runners crowded Asia’s premier destination resort “Laguna Phuket” from the Race Finish at the resort’s beachfront to the Transition Area at Laguna Grove outdoor event venue. 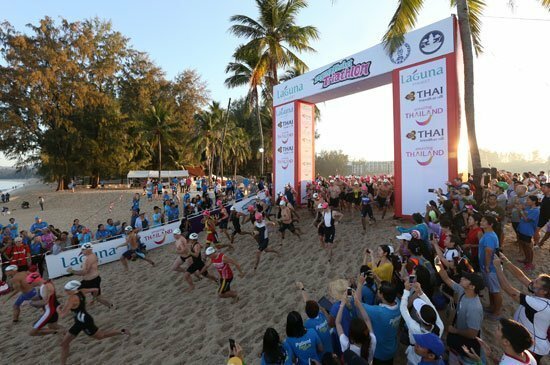 Most of the pros who raced today’s Laguna Phuket Triathlon will take a rest between their trainings for the Challenge Laguna Phuket race (1.9K swim, 90K bike, 21K run) next Sunday (29 November). Wowing the Thai crowd were two leading men in their own right; Jaray Jearanai was once again the first Thai finisher (in 2:57:54) while Artiwara Kongmalai, Thailand’s number one rock star best known for his stage name “Toon Bodyslam” finished his individual race in 4:36:27. 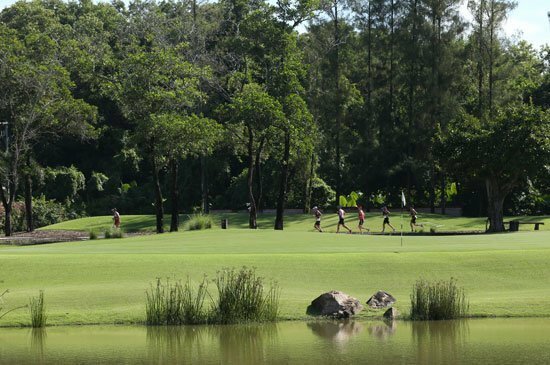 Award-wining 18-hole Laguna Phuket Golf Course was part of the run course.